On a frosty, early morning both the Dragons and Samurais were out warming up, full of energy despite the cold conditions. The strong gusts of wind whipped across the ground that had potential to make kicking a challenge today. Japan and China came into this match with a 2-1 record in their sections and losses in their semi finals. This meant they were playing off for 3rd and 4th place in Division 2. Being the highest ranked Asian nations in the International Cup, the title for the match 'The Battle for Asia' was being thrown around in the crowd. Both sides stood tall and sang with pride as their national anthems played for the last time of the tournament. The game began in typical fashion with both teams going in hard for the ball in the middle. Team China’s style of play throughout the game was pushing the ball forward at all costs, which worked out well as majority of their players played in front and were able to capitalise on the loose ball. In comparison to team Japan, who approached the game with a more technical game by hitting up targets and creating space for each other to run and carry the ball forward. The first quarter saw a lot of scrappy play, with targets being missed and most of the play being on the ground. 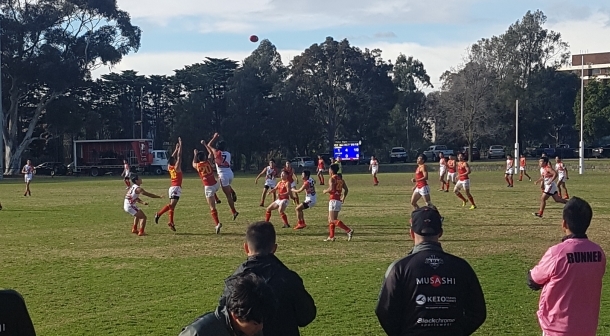 It took both teams a while to hit their stride but when they did, Japan was first to hit the scoreboard with Taisei Matsumura (#20) kicking a goal from 30m out on a slight angle. China then answered back, and locked the ball in their forward 50m, with relentless forward pressure resulting in a quick snap for goal from the pocket by Dean Wei. A few opportunities were missed by China to take a commanding lead heading into quarter time. 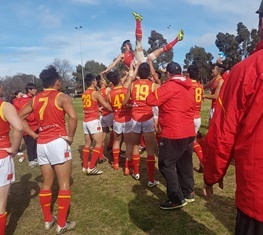 The Japan coach instructed his players at quarter time to go into the second quarter with more commitment to the ball, with at least two players at each contest and spreading the play. 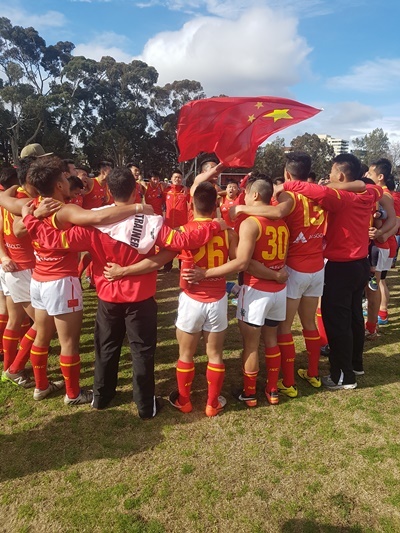 China dominated the second quarter in terms of possession but did not capitalise on opportunities in front of goal, only managing three behinds. Japan showed a good passage of play by breaking through the Great ‘defensive’ Wall of China and spreading the ball through the open space that was created and locking the ball in their own forward half but only troubling the scorers with one behind. Notable mention of the quarter was Hao Zhang (#1) for China with a goal saving tackle in Japan’s goal square. 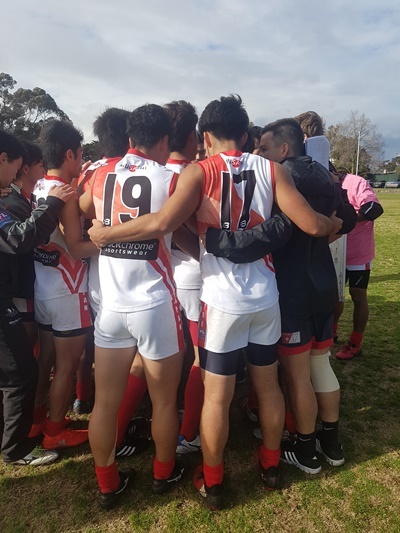 The Dragons went into the third quarter knowing they have had bad luck in front of goal with instructions to shepherd more, keep up the pressure and to tackle hard. “If you win the third quarter then you win the game!” Yelled the Dragons coach from sideline. 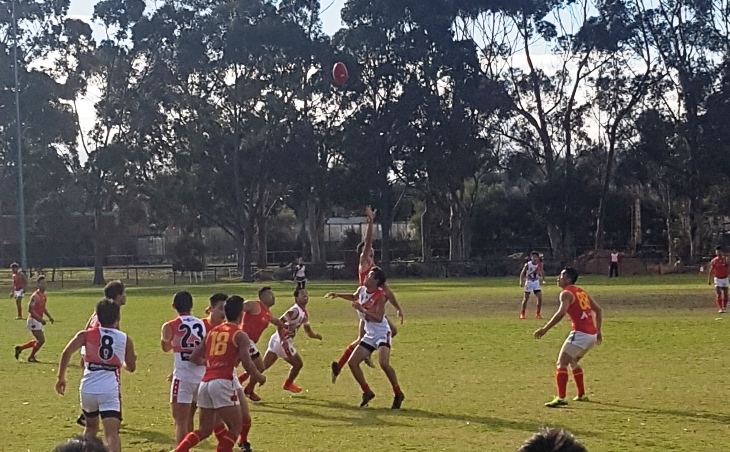 Although the Dragons started off quickly with the first goal coming from Brian Chueng, deep in the forward pocket, the game flipped and the Samurais started controlling the third quarter with majority of the possession, winning the hard ball and hitting many leading targets. With Jumpei Ito (#21) capitalising by producing a long drop punt from 50m out, the result of relentless forward pressure. 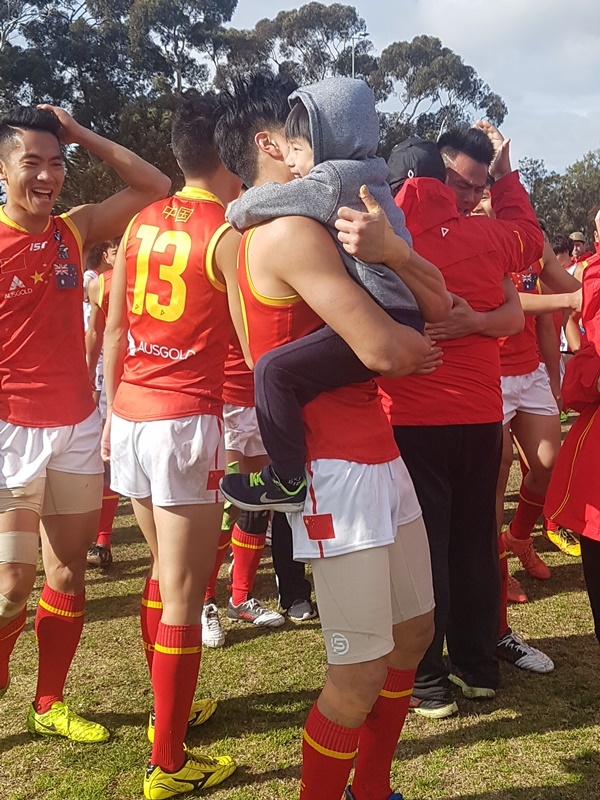 The Samurais went into the final quarter being reminded of their commitment to the footy and how much they want the win, having been fired up they started the fourth quarter with an aggressive intent as did China. With both teams well into their stride by now, it was by far the most entertaining quarter as third place was on the line. 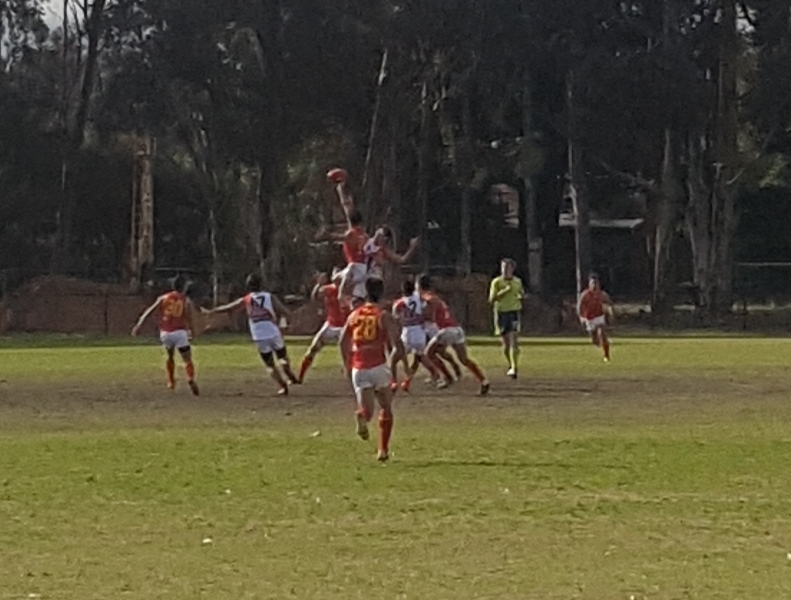 The first goal of the last quarter came from China’s Honghui Lin (#23) as he marked the ball 40m out, played on running towards goal and just managed to drop the ball on his boot as he was tackled producing a remarkable Daicos-esque style goal. Japan instantly replied with Sohei Tada (#17) smothering the ball in the forward 50m then unloading a huge kick from 40m out to bring them back within two points with nine minutes remaining. The sealer for China was scored at the 12 minute mark with Shaoliang Chen (#16) swooping in on the crumb with one hand, from a pack mark on the 50m line. He then wheeled around on his right boot and snapped the goal from 40m with the wind helping it curl straight over the goal umpires hat. The last five minutes was an incredible defensive effort by China to hold Japan scoreless and win the match, with lucky #88 dominating and commanding the entire ground as he pushed forwards and backwards to ensure the win.